Making a walking tour along this route, you will see a panorama of the left bank of the Neva, where the Winter Palace and the Admiralty are located, you can see the dome of St. Isaac’s Cathedral, as well as many other attractions. You can walk along the Spit of Vasilyevsky Island, see the place where newlyweds come to “wash” the rings. Find out where is located or even visit the Zoological Museum and Kunstkamera. Find out why Mytninskaya Embankment is so called, as well as explore all the sights of the Peter and Paul Fortress on Zayachy Island. If you want to visit the Zoological Museum or Kunstkamera on your way, you need to start the journey early, as it will take time to visit the museums, after which you have to walk to the Peter and Paul Fortress and check it every day, except Wednesday. Wednesday is a day off. The Zoological Museum - is open daily from 11.00 to 18.00 except Tuesday and national holidays. Cleaning day - the last Tuesday of each month. The walk starts from the Palace Square (No. 1 on the map), and this is symbolic. Palace Square has always been the main square in St. Petersburg. Long before the square itself appeared, there was wasteland at this place. In 1704, during the construction of the fortress - the Admiralty shipyard in case of an attack from land, as well as for reliable protection and unimpeded work of artillery, free space was required. After some time, the Admiralty ceased to function as a fortress, and the territory of the future area gradually turned into a place for storing ship's forest, huge anchors and other supplies necessary for the needs of the Admiralty. From 1712 to 1717, part of the wasteland was used as a maritime market, and most of it was overgrown with grass and fat called Admiralty Meadow. And only after the construction of the Winter Palace in 1762, the area began to gradually transform. In 1778, Empress Catherine II orders to convert the square. The building adjacent to the area of ​​buildings lasted quite a long time. 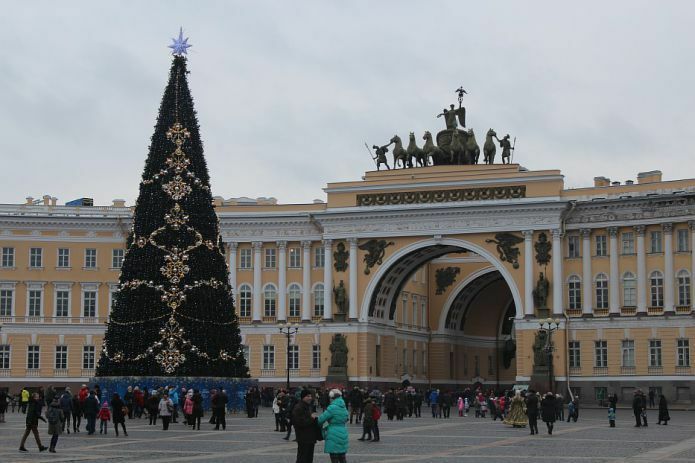 In 1828, the General Staff Building was built in the shape of an arc opposite the Winter Palace. In 1834, the Alexander Column was erected, marking the victory of Alexander I over Napoleon. Passing the Winter Palace to the left, we move towards the Neva River, cross the Palace Embankment at a pedestrian crossing and exit to the Palace Bridge. Palace Bridge (№2 on the map) is one of the most beautiful movable bridges in St. Petersburg. In 1853, at the request of the merchants, for quick communication with the Exchange, located on Vasilyevsky Island, and the institutions located in the Trade Port, Nicholas I decided to transfer the Ishakievsky bridge (floating) to the Winter Palace. In 1856, after three years of work, the bridge was moved. The bridge was built of wood and decorated on the edges of cast-iron floor lamps with lanterns, it is worth noting that during the ice drift the bridge, even then, could be divorced. 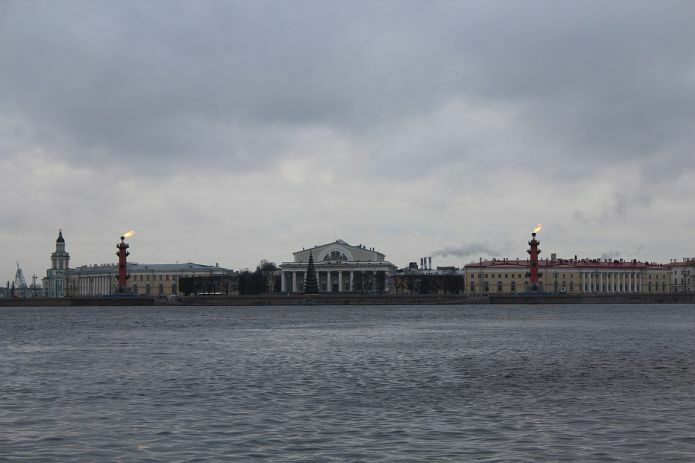 After 40 years, due to the need to create a green zone near the western side of the Winter Palace, it was decided to move the bridge 53 meters downstream. Back in 1882, an appeal to the City Government from various organizations and homeowners appeared with a request to build a new permanent one on the site of the old bridge. In 1901, a competition was announced for the best project of the bridge, but the Russian-Japanese war started in 1904, and then the revolution in 1905 forced the designers to freeze the work. In 1911, after the development of new requirements for the bridge and the holding of a new competition, an agreement was signed for the construction of a bridge with the Society of Kolomna Plants. According to the contract, construction was given less than three years, and one of the main conditions of the contract was the requirement to use only domestic materials in the bridge production, as well as the strength and labor of only Russian workers and engineers. But to build a bridge in time did not work, during construction there were various difficulties, and after the start of the First World War, the work was completely suspended. In 1916, all the same, they decided to open the bridge in an unfinished version, temporary wooden railings were made and ordinary lighting poles were installed. And only 23 years later, in 1939, a cast-iron railing was installed on the bridge. The length of the bridge is 255 m., Width 27.7 m.
Vasilievsky Island (No. 3 on the map) began to be built up under Peter the Great. The king saw this part of the island as a cultural and business center. In 1720, after the creation of the building project, the foundation of the future Kunstkamera building was laid, so the arrow of Vasilyevsky Island was gradually built up, merchant houses were built, the exchange (No. 4 on the map), customs and warehouse premises were transferred here. In 1810, the French architect Jean-François Thoma de Thomon built a new building of the Exchange made in the antique style. In front of the Stock Exchange building, the architect placed two Rostral columns (No. 5 and 6 on the map). The column received its name from the derived word "rostrum", which translated from Latin means "ship's nose", since each column is decorated with fragments of ships. The foot of the columns are decorated with figures representing the four great Russian rivers Volga, Dnieper, Neva and Volkhov. Columns past the decorative functions previously served as lighthouses. 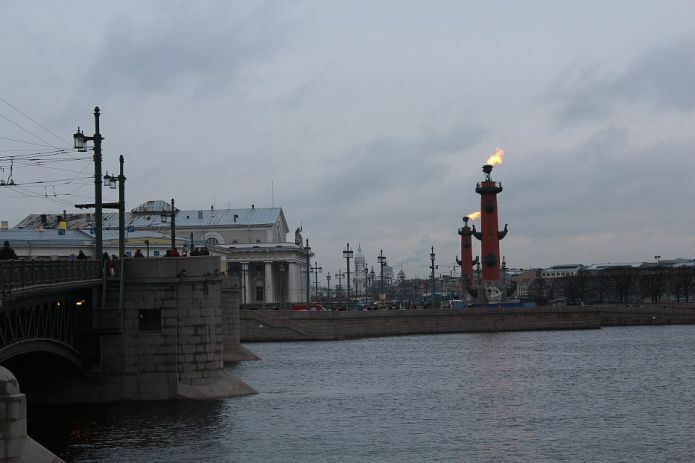 In our time, the fire on the Rostral columns is lit on a special occasion during the days of the celebrations and celebrations held in St. Petersburg. 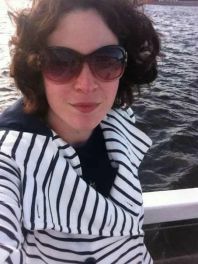 In St. Petersburg, there is a tradition; during the wedding, newlyweds come to the arrow and take unforgettable photographs by the descent to the water. Many St. Petersburg residents in the list of family photographs can find a memorable photo near the famous granite ball (No. 7 on the map) against the background of the Peter and Paul Fortress. Tourists and guests of our city also love to take memorable photos in this beautiful place. Also in the neighborhood are the Zoological Museum (No. 8 on the map) and the Kunstkamera (No. 9 on the map). (№10, on the map) The first bridge at this place was erected in 1894. The bridge was wooden, had 25 spans, the length of the bridge was 326 meters, and the average 14 meter span was adjustable. The modern bridge was designed in 1940, but the Great Patriotic War prevented the construction, so a new bridge was built only in 1960. Stylistically, the new Exchange Bridge was decided to stand in the same style as the Palace, thanks to which the view of the Spit of Vasilyevsky Island from the Palace Embankment acquired proportional and regular shapes. (№11 on the map) The name of the embankment comes from the Customs Office located earlier in this place (Mytny Dvor). In ancient Russia, the word "myt" meant "duty." (№12 on the map) By order of Peter I in 1703, construction began on a fortress at the mouth of the Neva River. It was decided to build a fortress on the island of Enisaari, which translated from Finnish meant Rabbit. As they say in the legends, Peter I personally chose the place for the future fortress. The top view of the fortress has the shape of a six-pointed star, 300 cannons are placed on the ramparts. On the territory of the fortress is a cathedral in the name of the apostles Peter and Paul. Earlier, the cathedral served as a tomb for the Russian monarchs of the House of Romanov. Russian emperors and empresses from Peter I to Nicholas II rest in the cathedral, except for Peter II and John VI Antonovich. The relics of the last Russian emperor Nicholas II and members of his family, transported from Ekaterinburg, were buried on the territory of the Peter and Paul Fortress on July 17, 1998. 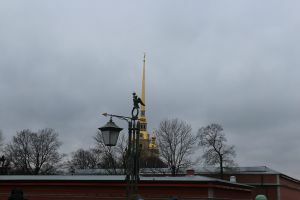 In the 18th century, the fortress was used as a prison, and in the 19th century, the Peter and Paul Fortress became the main political prison. 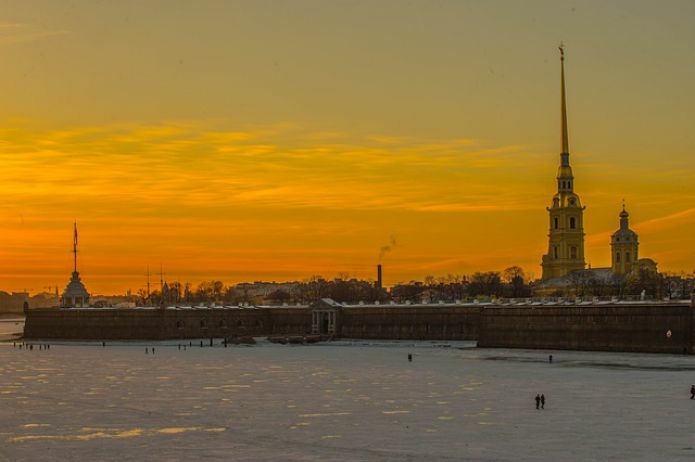 A visit to the Peter and Paul Fortress can be unforgettable. Be careful at 12 o'clock in the afternoon, in St. Petersburg they honor the traditions established by Peter the Great, and in confirmation of this at 12 noon from the Naryshkin Bastion an idle gun shot occurs. On the territory of the fortress there is something to see: the Mint, the bastions, the Tsar's Rooms of the Peter and Paul Cathedral, as well as the monument to Peter I, made in the original style of Fyodor Shemyakin. If you have free time, you can visit the Zoo (No. 13 on the map) next to the fortress or the Artillery Museum (No. 14 on the map).